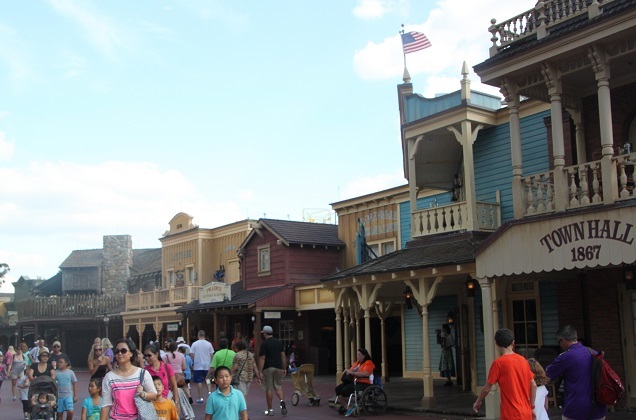 We followed the sound of banjo music and found ourselves back in the days of the Wild West in Frontierland – the Magic Kingdom’s take on a prairie outpost. 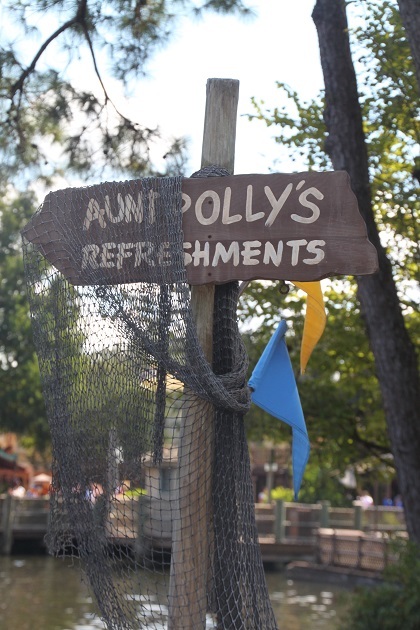 I loved this area, such great theming and attention to detail, you expect to encounter cowboys and Indians round every corner. The clapboard buildings look great and apparently are structurally consistent with buildings from the 1800’s. The staff are all clad in gingham and denim and there are mesquite trees and cacti everywhere. Plenty of banjo music in the background and a river flowing beside the “town”, I would have been more than content to chill out here, take a seat and people watch. Son had other ideas. 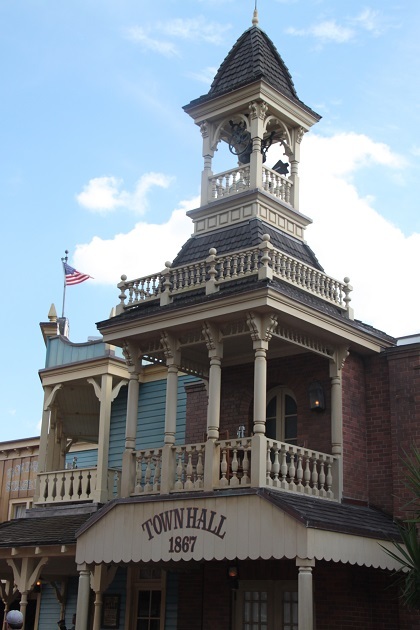 We headed first for the Country Bear Jamboree – a bit cheesy but fun it was in a large theatre and had animatronic bears playing country music. 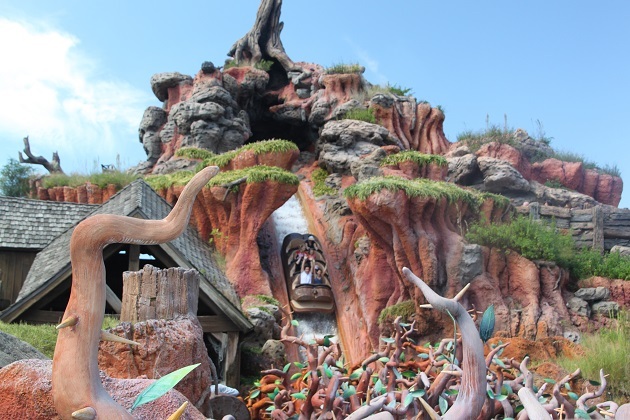 Splash Mountain was next, we boarded a log flume and entered the world of Br’er Rabbit and his pals. Lots of cute animatronic scenes from the story and music from Song of the South all interspersed with a series of drops and plunges of varying heights. Some were quite intense, especially the drop in pitch black – that made me catch my breath. At the very end we plunged down 5 storeys, a camera caught our screaming faces and we splashed back down to earth. We rode this twice – first at the back on the left hand side and were barely splashed, next at the front and were completely soaked. Still, we soon dried out and it is actually a bit of relief in the hot Florida sunshine. 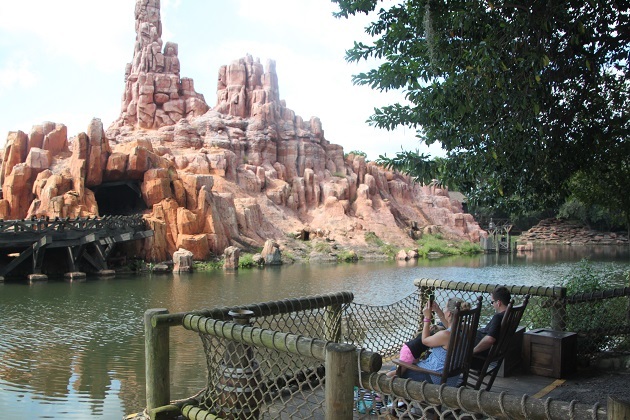 Big Thunder Mountain – Son’s all time favourite ride – was tried out numerous times on our visit. It is quite fast and a twisting and turning journey through a gold mine. Some sharp turns and drops but the thrills are mild – that always suits me. We dipped and turned through caves and mountains designed to resemble Monument Valley. 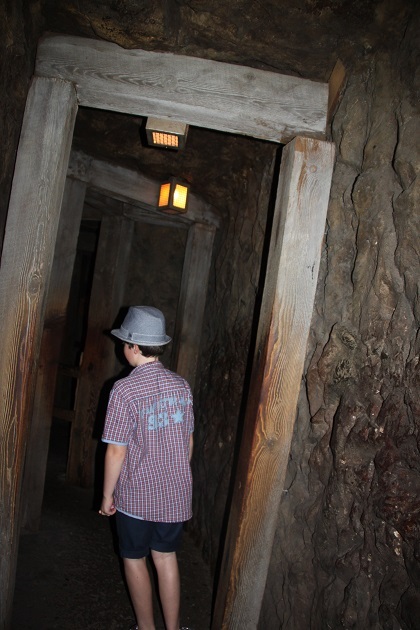 Lots of mining equipment and “falling rocks” mean great theming here too. First time we missed the attention to detail, several rides later I think we safely saw everything. 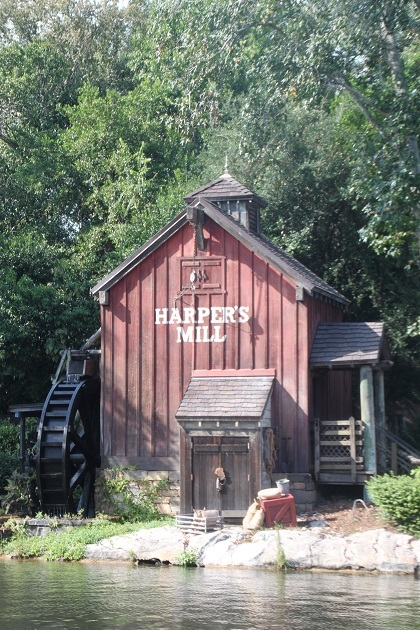 We also rode this a couple of times at night, in the dark the thrills are more intense and it is even more fun. 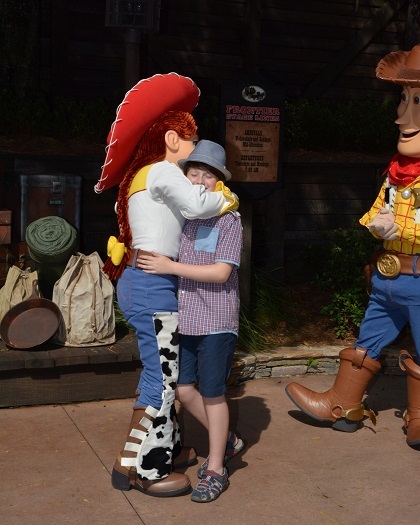 A meeting with some of the Toy Story characters, Son was a little weirded out by the hugging and shows of affection, Husband had no such issues with Jessy! 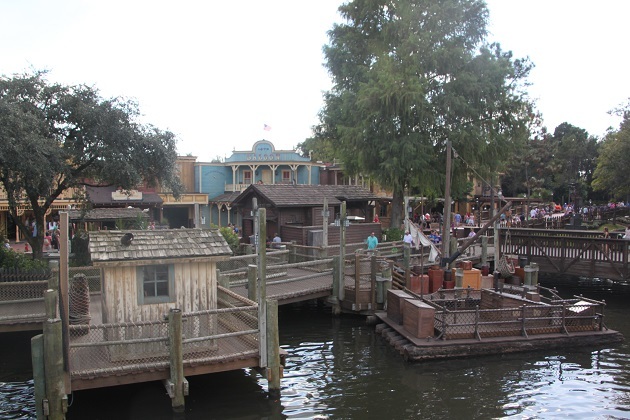 Last but not least was Tom Sawyer Island. This is a bit of a hidden gem, overlooked by us on previous visits which seemed to be common amongst the visitors on our day there. Not busy at all, in fact almost empty, we took a short raft ride over to the island, explored a series of walking trails and found plenty of shady spots to sit in big rocking chairs and relax. Games of checkers were scattered around and places to explore meant Son was happy too. We chilled out in the shade of some big pine trees, sat on the rocking chairs and watched the hustle and bustle of the Magic Kingdom across the water. 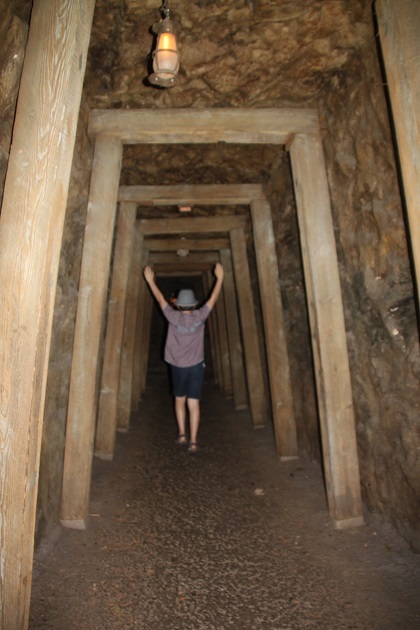 Son found some “caves” and a water wheel then we all crossed the rickety barrel bridge. A pulled pork sandwich later and we were on our way having had a great time in this pretend prairie outpost. One of the best parts of MK (in my opinion) and one of my favourite rides. Completely agree – we loved it! 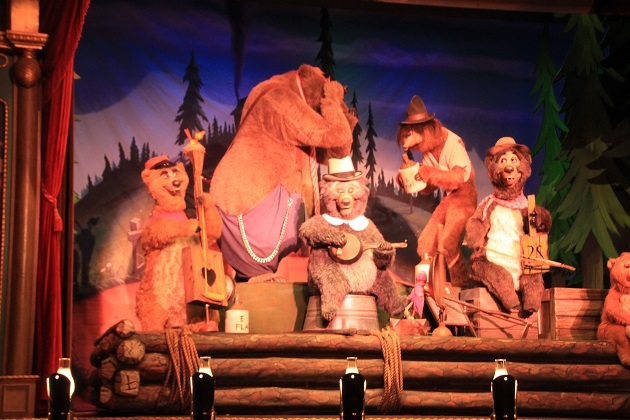 I love Country Bear Jamboree! I think they were closed for refurbishment the last time we were there. I wonder if kids even know who Tom Sawyer is anymore? I loved it too and that’s the first time we ever saw it!! That was definitely the best part about not trying to fit in too much and too many parks, we got to experience gems like this that we otherwise would probably have skipped. Very sad but true about Tom Sawyer too!! Joy, your photos truly look magical! Thank you Pam – but then it’s Disney!! Oh Rosemary – you sound just like me!! I used to just jump on any ride and never give it a second thought – no more though I have turned into a total wimp and don’t go on anything involving speed or big drops!! My husband loves rollercoasters and thrill rides – the worse they are the better, but anything that spins or turns (even suitable for babies) and he is green around the gills…. No problem here though, all the thrills were moderately mild so all was well!! Hope you’ve had a good week and enjoy your weekend too. Great relaxing post, I like the feeling of being in this part of the park. Must be the banjo! Banjo music definitely has that effect!! Great look at one of my favorite lands in Disneyland/World. 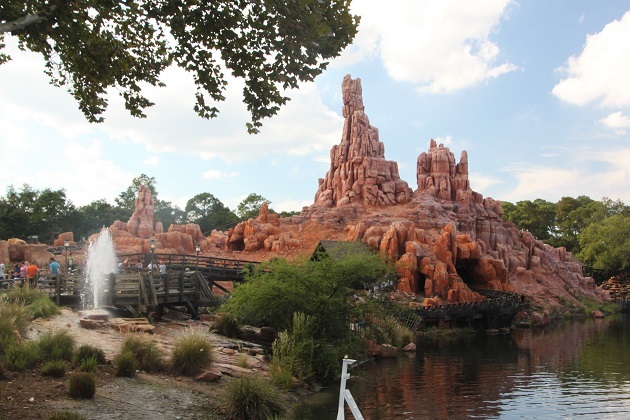 I like Big Thunder Mountain much better than Splash Mt. but I’m a wimp and don’t like those long drops. I love the ride up til that point though so opt to get out before the drop. I just read Disneyland is taking out some of Frontier Land’s stuff to replace it with new attractions like new Star Wars stuff. When complete I’ll have to make a visit to see what’s new. Completely get where you’re coming from – I am just the same and the older I get the more of a wimp I am becoming. No thrills and drops for me anymore, Splash Mountain caught me a bit by surprise but I survived!! Interesting about all the new stuff, will watch with anticipation and hopefully we’ll get to check it out too. Here’s a link to the article about the closures in Disneyland to make room for new Star Wars land. I imagine DisneyWorld might be doing the same, but am not sure. Will ask my Mom who is a long time season ticket holder. You’ll have a ball when your little grandson is big enough to ride!! Thank you so much for the link as well, just had a look and it sounds really great. Showed my son and he is hugely excited – let’s hope Disney World go with this too. 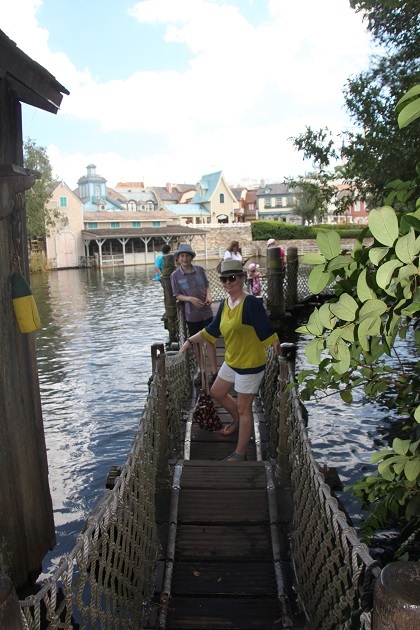 We are actually lucky enough to visit Florida most years – the year before this trip we spent our time at Universal and Islands of Adventure and just loved it all. We need to go back though to check out the new Harry Potter train and other bits!! I really hate rides where you get wet! I also can’t really take rollercoasters and all that but sometimes my kids make me go 😛 Looks like you had a blast! I am a rollercoaster wimp – never ride anything that promises big thrills, I just can’t take it!! I’m not mad on getting wet either but it was so hot that day we dried in 10 minutes!! I love Magic Kingdom and all the parks at Disney Workd and as many times as I’ve been there I always find something I’ve never done before or love to see again. The crowds are crazy and the summers are tough but if you plan it right, it’s very enjoyable. Glad you had a great time, Joy. We visited in late October George and the crowds were not so bad at all, not much queuing and plenty of space which is just how I like it. Also not the intense heat of summer but plenty hot enough for us pasty English folk who don’t see the sun that often anyway!! That’s a great time of year to visit. Glad you enjoyed it. 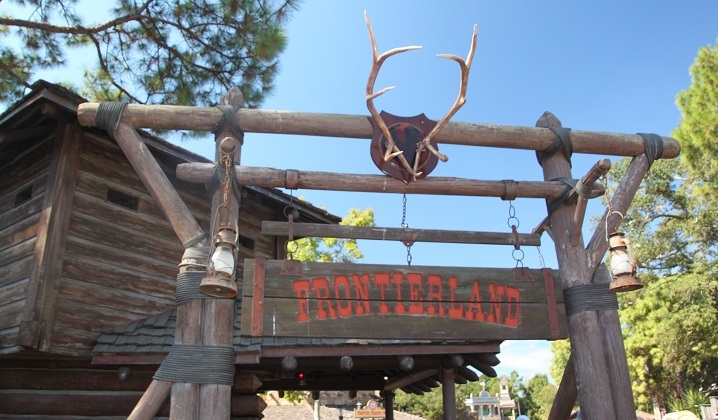 Loved Frontierland as a kid and Big Thunder Mountain was my favorite ride of all time! I’m with your son on that one! It’s a fabulous ride – just thrilling enough but still tamer that a big coaster, suits me down to the ground!! 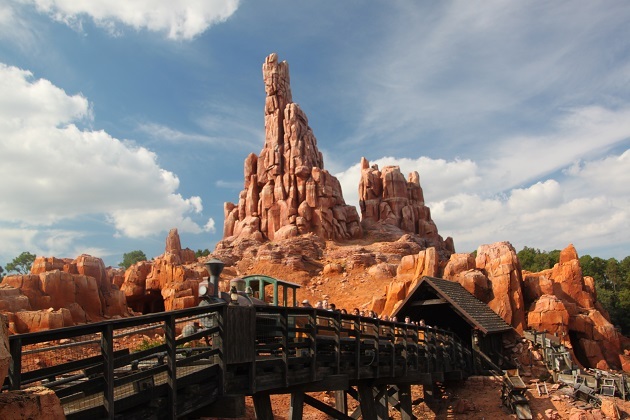 It was amazing – Big Thunder Mountain stands out in my mind now because we rode it sooo many times – still loved it though! My stomach for thrilling rides is not so strong anymore!! I have turned into a wimp…. Late October early November seems to be a really great time to visit, we’ve been before in summer and in May/June, this was definitely better, less crowded and not so humid. Children love it here but great for adults to revisit their childhood too!! 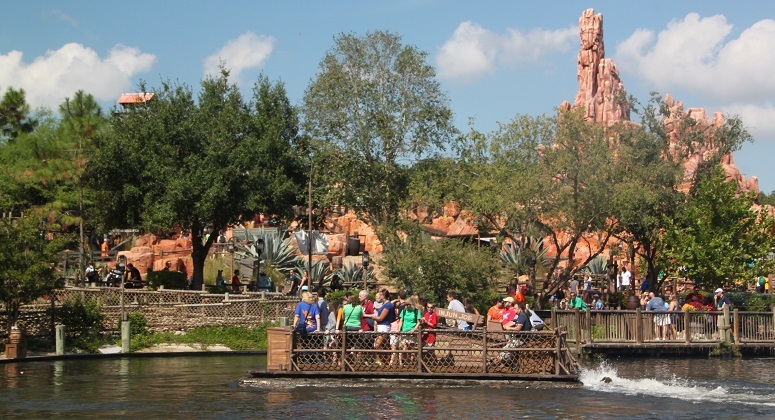 Difficult to pick up my favourite part of the park because I have so many favourite rides, but I love Frontierland and its atmosphere. Beautiful weather, beautiful pictures ! Hard to imagine those blue skies now and the sunshine, well I’ve forgotten that completely in these grey, rainy days!! 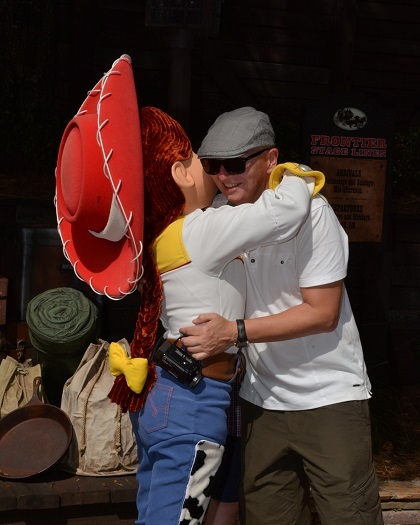 And which Toy Story did you hug? Buzz? It’s a special place Jenny – I definitely understand the feeling of missing it! !